On September 23, T-Mobile announced the world's first Android-powered phone, the G1. The phone comes preloaded with Search, Maps, Gmail with Contacts, Calendar, Google Talk, and YouTube. The applications are easy to use, fully synchronized with the web, and work together in new and innovative ways, as explained in our first post in the blog series: 'Google on Android'. Over the next couple of weeks, we will put the spotlight on each one of the Google applications for Android. Today: Maps. -- Marc Vanlerberghe, Product Marketing Director. When we designed Google Maps for the T-Mobile G1, we set out to create a great mapping application that took full advantage of the G1's hardware, like the touch screen, accelerometer, and GPS, as well as the deep system integration made possible by the Android platform. One of my favorite things to do with Google Maps on Android is to explore new and favorite places. You can pan around and zoom in and out easily using just your thumb on the touchscreen -- a big plus for all those times when that other hand is unavailable. And if I want to see a restaurant or building up close, I can switch to Street View and view a panorama from street level. I can even turn on Compass mode to let me look around the panorama by moving my phone up, down, and to the side. It's like popping up a virtual periscope anywhere you want to check out what's there with your own eyes. Check out the video below for a quick demo. 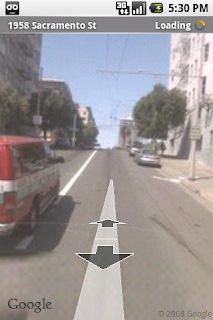 Note that Street View on Android is only available in the US at this time. When I'm in a new city or just a new part of town, I like to turn on My Location. It can use GPS or just the nearest cell tower to tell me where I am and re-center my position in the middle of my screen when I approach the edge. When I'm walking or in a taxi in a dense city, like New York, I zoom in to street level and turn on GPS for the highest accuracy. And as I wander the city, I can search for nearby businesses (like restaurants), and use Android's integrated Map features to save search results to my contacts. For instance, if I find a restaurant that I like, I can save it to my contacts and then later on call it or Map it with one touch. In the future, when I do another search with Maps, I might even see this contact again as a suggested search result along side past queries. Maps is also integrated with email, IM, and the web on Android. For instance, street addresses that appear as plain text in these apps become touchable zones that you can click on to take you straight to Maps. Something similar happens when a Google Maps link is pasted into an email, IM or placed on a web page. When I touch it, I can choose whether to view the map in the browser, in Google Maps, or in any other application that's built to handle what's known to Android developers as an "intent." Or, I can make the choice once and save it as my default map-viewing application (Google Maps, in my case). Perhaps best of all is that most of the resources, flexibility, and functionality in Google Maps are available to any application written for Android. Cab4me and Locale are both Android Developer Challenge winners that used the Android platform to build compelling applications with maps and location at their core. Any developer can use Android's MapView and location APIs to build location-aware mobile applications like these. While the team is proud of Google Maps on Android and other cool applications we've seen to date, we're equally excited to see what new kinds of maps and location-enabled applications developers create in the coming months. Will this be available for the HTC Touch Diamond? While this has some nice improvements over the iPhone Google Maps app, the beginning of this post really comes across as yet another shameless plug for Android on the Google Mobile blog. Isn't it about time you guys create an official Android blog, and keep the Google Mobile blog to things that are more universally applicable to mobile devices? Is it like yahoo go? This is one of the few things in life that I am looking forward to owning. Is MyMaps enabled in the Android version? ...still love to have audio turn-by-turn directions. It would be great if the blackberry pearl "voice search" feature for Google Maps was available on the G1. It's hard to imagine there's actually a feature they left out of Android that's readily available on Blackberry! Unfortunately, it seems the built in Maps app on my G1 does not include Transit or Walking directions, which is a shame - Especially in NYC where the majority of residents don't even have a car! Any plans on adding those features any time soon? I am a bit shocked that there are features on my Google Maps for Windows Mobile phone that are not on the G1. For that matter, whatever happpened to copy+paste? All in all, its still an incredible phone. Just needs some fine tuning. Transit needs to be put in Maps for the G1. Being able to pan around in compass mode is all well and good (my friends always get a kick out of it,) but not being able to look up bus and train directions is a glaring issue which needs to be remedied. It's really amazing how you can call this version of google maps an advancement with a straight face. im sure you all are amazing developers, but i question your ability to understand user needs. Street View is a nice show off, but useless for most G1 users. The time you spent on it could be better used if you worked on making the map follow My Location instead. What were you thinking when you made it re-center only when My Location is on the edge? Have you ever thought about its usefulness? The only way something can approach an edge is moving towards the edge. Wouldn't that mean the intended direction of movement is towards an area that is on the other side of the edge? Thus wouldn't it make sense to let the user see what's ahead? People use the G1's GPS under two conditions: when they are walking or driving. In other words, when they are trying to get some where. When they are walking, manually panning the map is not a big deal. But what about when they are driving? Regardless, there is absolutely no use for a map that re-centers only when the location to be shown is no longer on the map. You had this functionality for all your other versions. My suggestion to you is get the basics down before trying to do something cool. Google Maps for the G1 is garbage, much like a car with a super loud muffler but no engine. I'll have to highly agree with what ARIS said in the above post. I would seem silly not have the map recenter automatically, the only way to do this is to continue to press menu>my location, which stinks when your driving and walking alike. It seems like the my location feature should include the ability to turn my location "on" (with automatic centering) or "off" where you can move off center. I mean really, why was this not included in android maps?? The mobile maps even did this on my razr 3 years ago, why not on such an advanced device? There are many locations which i go that do not have exact intersections or address. In every other version of google maps to date, you could drop a pin on a location and get directions to that pin, as well as save that pin as a favorite. The program you mention, Locale, can even do this, but your own port to android of your own maps program CANT? Major, major oversite there in my opinion. Not to mention, you are updating iphones own google maps app WITH walking and transit directions and times- yet lack this feature entirely within android. As well, as, iphone is about to recieve Streetview soon, and in that streetview you even have the street labeled, also lacking in android- AND you can not street view an exact or choosen location, you have to zoom to the area and drag/drop a streetview icon while hopeing thats about the address you are looking for. Showing that it isnt just this small handful who are loosing with the missing features. Goodmaps on Android is NOTHING to be proud of at the moment. We are all hoping you atleast bring us up to the features that were even available a few years ago before trying to add anything new or revolutionary. Sure if you want to do "new" syncing with 'my maps' in google online would be a dream, then atleast i could drop my pins there, save locations and then view them in my g1. But these are basic included features on every other platform with the hardware to do so (such as GPS or touch screen) AND online. But basic things like pins you can even get on regular run-of-the-mill phones. Why are these things missing? My G1's compass mode has only worked when moving up and down, it does not work when moving side ways. I have tried using a non magnetic case for 2 days to see if the compass would calibrate and work but nothing yet. What is up. Google maps is a joke compared to VZnavigator on Verizon. Nuff said. Seriously, no Public Transit or Walking directions in Google Maps on your own device, but you're providing it in the downloadable mobile map version (which I can't seem to run on the G1)? Driving directions are worthless to me - I live in Chicago. Please tell me you're including Transit in the next update. What could possibly motivate you to leave this out? I thought I was the only one.. until I found this blog and the posts on the androidcommunity forums. I went from a pearl 8100 to the G1. On the Pearl Google maps has the voice search function and it is unbelievably great ! I am amazed with the accuracy of the results and the usefulness while driving. I am shocked that somehow this and other features were left off of the one phone that is supposed to star Google and their new operating system. We will see if they upgrade this ap if not what does that say about the importance Google is placing on Android..
Guys, I live in SF and don't have a car. You're telling me i need to use maps.google.com to get walking or transit when the app is installed? Please give people a roadmap of updates you want to hit. Myself and many friends want reader, docs, and maps working.. many people know it's coming, just tell them how long its gonna take, or you might start losing people. Use accelerometer to identify if the display should be portrait or landscape. Compass is currently useless in any mode where the use has the hardware oriented vertically. Compenstion by using accelerometer and a 3d type view for what appears to be ahead of the user would be handy. For drivers, maps needs a 'night' view that makes use of some sort of ambient light sensor, like a camera perhaps, to determine what the screen brightness should be simple enough to do. Rerouting both by dragging the route line, and dynamically as the user strays from the pre-selected route. And if you haven't read the responses to the current re-centering on edge discovery as a really bad idea, this comment is apparently as useless as the earlier ones. Just as a side note, it would be nice if the author or someone from the development team would even acknowledge that these comments are being seen. If you have to say, 'get that from a third party app' as a response, that's better than what we are seeing here so far. I am just surprised at how distanced the team seems from their own product. I got this phone because I thought there would be some kind of community and I thought google would be passionate about gaining some market share. For instance: there would be a dedicated android blog from Google. Like weekly updates "hang tight guys, we have X coming soon", I have 3 friends who have all returned their phones because they are just missing so much functionality, and there is nothing in sight. The most common remark is "maybe I'll try again in 2 years". We all want to support Google, but I am considering taking my phone back as well before my 30 day window runs out. Also, to hear things like the phone does have multi-touch capabilities but they were gimped and not see one comment coming from Google. "Hey! Awesome, you have an android! I really want one!" "Oh man, wait a year, there's not much software support and I spend more time charging the device than using it." It doesn't make the platform look too appealing. I've had my G1 for about two weeks, and Google did far more right than wrong in this 1.0 version of the software. On thing that did disappoint me was the poor integration between Maps and Street View. on the pin, there's no option to switch in to Street View! In fact, the only way to get there is to go to Menu > Map Mode > Street View, then try to place the location where you think the object you were searching for was, because the marker has now disappeared. Even if you can remember where the pin was, odds are your fat fingers are going to be unable to place the Street View location where you want it. I submit to you that this is 1). bad UI in it's own right, and 2). a different workflow from the PC version of Google Maps, in which the transition from Maps to Street View and back again is pretty seamless. This might seem like nitpicking, but it puts the Street View firmly in the Toy category, rather than a Tool. I hope that Google's "release early, release often" philosophy applies to Android as well. I write this as i sit on the bus ive taken for 5 years to and from work now. Denver has a wonderful transit system and i was thrilled when maps for my old sprint LG Fusic and my Blackberry Curve and its gps made it so easy. start: my location. end: work/home/friends place/theatre whatnot. BOOM. Instant directions, bus and light rail times. This was almost a yeaar and a half ago since your J2ME Maps program supported this EXTREMELY useful and in my car-less life TOTALLY REQUIRED feature! I bought a G1 and for the most part i love it and its features but COME ON where the HELL is TRANSIT?!?! As an aside, your default browser and its only third party replacement, Steel, have horrible textbox editing ability. The trackball skips in and out and bounces the damn orange select bubble all over this page just trying to get back to the end of current input. Isn't it a bit embarrassing to boast about one of the weakest apps on Android and one of the weakest implementations of Google Maps in anu form? Where is public transit on Android? Lame, lame, lame! I have to chime in with Aris. seriously, no tracking your location? using the maps app while driving is downright dangerous if you constantly have to click and make it center on your location manually. honestly. MS's live app on windows mobile was a huge upgrade. i figured, since android was your OS, google would lavish care upon it. but this feels like the red headed step child. we love the phone! don't let us down! 1) simple tethering without root.